All songs were written, performed (apart from “Skating on thin ice”) and recorded by Andy in his home studio. He recorded onto two ADAT recorders, synced with midi to various tone generators and his Yamha SY77 workstation, and then mastered to cd via a Drawmer Masterflow compressor. 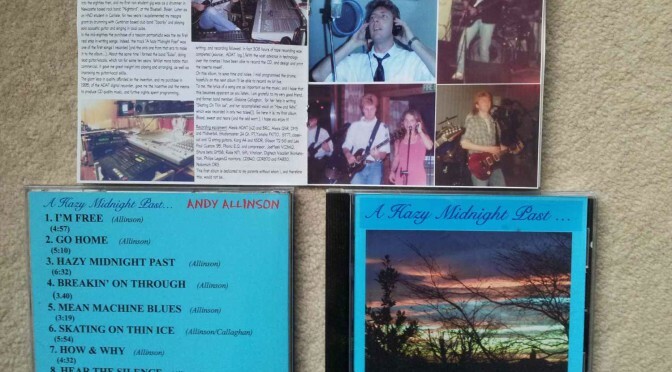 The following songs are from the Hazy Midnight Past album (mcps no; ALRCD1) . Titles in green have a link to music and/or lyrics. Thanks for the tracks you sent me. I didn’t get to your Gatehouse gig, but my friend did and loved your music! She said she liked your leather trousers??? Hi, Enjoyed your music. When are you playing again?